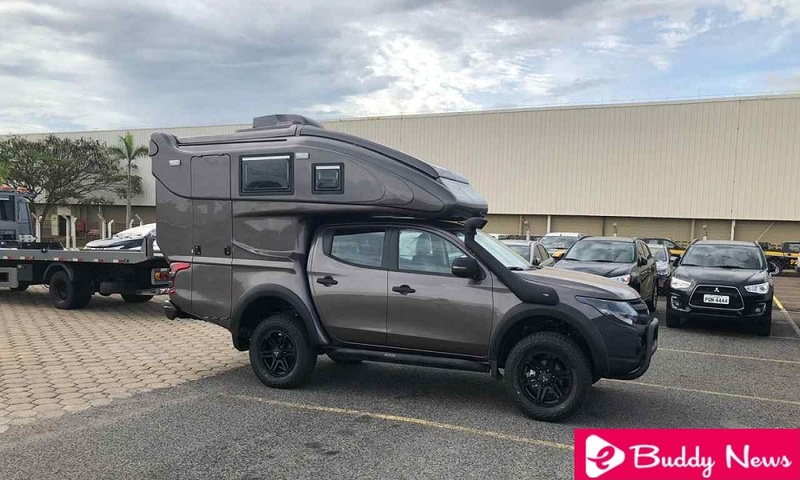 A partnership between Mitsubishi and Duaron Recreation Vehicles will put at the Salon d’Automobile 2018, which takes place between 8 and 18 November, a medium-sized Mitsubishi L200 Motorhome, Triton Sports truck adapted for motorhome, although this type is better known as the camper. Mitsubishi L200 Motorhome named after the Mitsubishi Triton Sports Duaron, the pickup aims to cater to the enjoyment of camping activity or 4 × 4 adventures with “motor-home.” The vehicle comes fully customized and suitable for off-road activities, with the front push rod, black front bumper, side bolsters with protection, darkened alloy wheels, headlights with black mask and even snorkel, for course transposition deeper water. The Mitsubishi Triton Sports Duaron features a rear cab made of composite and imported fiberglass, as well as PVC and navy plywood coatings. Inside, the furniture is aluminum and fiber. The structure added to the L200 required a cut in the original bucket, which was maintained, to add the access door with folding ladder. With air conditioning of 7,500 BTU’s erected, as well as two other ceilings, the Triton Duaron measures 3.23 m, but with the same ones collected, the height is in 3.00 m, facilitating access in low garages. As a small house, the L200 camper has kitchen with 80 liter refrigerator and two burner stove as well as bathroom (no door but with curtain) with sink, chemical toilet and shower, two awnings, 5 kg gas bottle, battery of 115 amps, three ceiling elevators (one manual), among others. The Du200’s L200 also has a double bed, a removable table with two armchairs and several lockers and windows with screens against insects. The vehicle still has a water reservoir and water box (which was used in the kitchen and shower), among other items. By the configuration presented by the company, the pickup can take a couple and possibly another one or two people. In addition, there is a passage between the house and the pickup, that maintained the double cabin, thus being able to take four people. Prices have not yet been revealed.